While affecting all structures within a joint, OA has generally been defined as a disease characterised by loss of hyaline articular cartilage. Adult articular cartilage exists as four distinct cellular zones. The superficial zone consists of one to two layers of flattened chondrocytes expressing proteoglycan 4 or lubricin, SRY-box 9 (Sox9), type II collagen, aggrecan, tenascin C and low levels of cartilage intermediate layer protein. Chondrocytes of the intermediate zone are round in appearance, do not express lubricin, but do express higher levels of cartilage intermediate layer protein. The chondrocytes of the radial and calcified zones express markers of chondrocyte differentiation and hypertrophy, such as type X collagen and alkaline phosphatase. Each of the articular cartilage regions is normally maintained throughout adulthood unless stress-related injury, inflammation or a genetic defect leads to the loss of either the signals required to maintain these cells or the signals required to inhibit excessive differentiation of these cells. Disruption or impairment of the signals that inhibit excessive differentiation is believed to be the basis for diseases, such as OA.5 ,6 Therefore, much attention is being directed toward studying cellular and molecular mechanisms that regulate chondrogenesis and chondrocyte differentiation. Research has focused on factors that affect chondrocyte metabolism and on the mechanism of cartilage matrix degradation. This has yielded creative approaches to cartilage protection, including the use of agents active on bone turnover, antibiotics, such as minocycline, which inhibit metalloproteases, and other drugs that nullify the effects of cytokines on cartilage. These types of therapies are termed disease modifying OA drugs (DMOAD) or chondroprotective treatments, because they are focused on preventing the loss or encouraging the regrowth or healing of damaged articular cartilage. Despite advances in our understanding of cartilage metabolism and disease process and the development of new agents and treatment strategies, DMOAD agents have not as yet been added to the therapeutic arsenal. This is generally because such treatments have not demonstrated clear-cut efficacy in human disease. This statement is in itself controversial because a number of treatments have shown possible efficacy. However, no regulatory agency has approved a therapy that is a DMOAD.3 ,4 ,7 Efficient strategies for the development of new OA modifying therapies are therefore essential. These approaches include the identification of those factors that are players in OA and can serve as targets for prompt pharmaceutical treatments. Importantly, Yano et al have identified a new potential DMOAD candidate (TD-198946) with strong chondrogenic activity, tested its efficacy as a DMOAD using an OA animal model and investigated its mechanism of action.8 These authors propose that the compound exerts its effect by regulating Runx1 expression, which possibly underlies the therapeutic effect of TD-198946 on OA. Localisation of mesenchymal cells, the chondrogenesis process in the joint and targets for a new DMOAD: Three locations for MSC have been identified in the OA joint. (a) articular cartilage, (b) synovial fluid and (c) synovial tissue. MSC can reach the sinovium by migration from systemic circulation or from haematopoietic marrow through subchondral bone. Chondrogenesis is the process for creation of chondrocytes. During the early stage in chondrogenesis, MSC expresses such transcription factors as Sox9, Nanog and Oct3/4. As the cells differentiate into chondrocytes, the cells begin to produce an extracellular matrix rich in the mature form of type II collagen (Col2), COMP and aggrecan (Agg) as well as the transcriptor factor Runx1. Eventually, these cells begin the process of hypertrophy. As hypertrophy proceeds the cells continue to enlarge, generate a mineralised matrix and further enhance their expression of type X collagen (ColX), Runx2 and MMP13. Intra-articular administration of drugs increasing the Rux1 expression can induce chondrogenesis and block hypertrophy promoting the repair of damaged articular cartilage. COMP, cartilage oligomeric matrix protein; DMOAD, diseases modifying for OA drugs; MMP13, metalloprotease 13; MSC, mesenchymal stem cell; Sox9, SRY-box 9; OA, osteoarthritis. This interesting balance between chondrogenesis and hypertrophic differentiation may be because TD-198946 exerts its effect through regulating the expression of Runx1, a known inducer of chondrogenic differentiation and a suppressor of the subsequent hypertrophy.10 The mammalian Runx protein family comprises three transcription factors: Runx1, Runx2 and Runx3. All Runx proteins are expressed during chondrogenesis; however, experimental results show a distinct role for Runx proteins in chondrogenesis and subsequent chondrocyte maturation.12 ,13 Runx1 is highly expressed during chondrogenesis in comparison with Runx2. Overall, the expression of Runx1 remained significantly higher than Runx2 expression during early limb bud cell maturation. Studies further indicate a role for Runx1 during early stages of chondrocyte maturation, whereas Runx2 is important in mediating terminal chondrocyte differentiation.12 Yano et al8 show that Runx1 is expressed in the superficial and middle zones of adult normal cartilage (mouse and human) above the tidemark, but not in mineralised cartilage; however, its expression is downregulated in OA cartilage. Runx1 expression was restored by TD-198946 treatment, and gain- and loss-of-function experiments revealed that Runx1 mediated the chondrogenic action of TD-198946.8 Runx1 directly enhanced the promoter activity of COL2A1 through specific binding to a Runx motif. The potential important role of Runx1 as a target to treat cartilage degradation proposed by Yano et al8 is supported by a recent publication reporting another small molecule, Kartogenin (KGN),14 with chondrogenesis capacity but with slight effect on hypertrophy and calcification. KGN has the capacity to induce chondrogenesis by regulating the binding of the core-binding factor β subunit (CBFβ) to Filamina A (FLNA) or Runx1. FLNA is an actin-binding protein that cross-links actin filaments and its expression is increased in OA human mesenchymal stem cells (MSCs).15 The binding of CBFβ to Runx1 induces chondrogenesis; however, its binding to FLNA reduces chondrogenesis. KGN blocks the interaction between FLNA and CBFβ, promoting translocation into the nucleus of CBFβ where it binds to Runx1 and regulates transcription and chondrogenesis. Lineage-specific differentiation in the presence of KGN was confirmed by fluorescent immunostaining of chondrocyte-specific proteins, including type II collagen, Sox9 and aggrecan.14 These authors suggest that KGN also has DMOAD capacity because the intra-articular administration of KGN, and subsequent histological analysis and grading of the medial tibial plateau, revealed regeneration in the cartilage matrix, as indicated by a decrease in the fibrillations in the superficial and mid-zone of the articular cartilage. In addition, there were significantly lower levels of cartilage oligomeric matrix protein in the mice treated with KGN. An additional factor in the repair process involves the synovial membrane as a neighbouring tissue.25 ,26 It is possible that cells in the synovial membrane having chondrogenic potential can migrate to damaged cartilage to participate in the active process of cartilage regeneration and repair. In support of this possibility, higher levels of MSCs markers have been found in the synovium and synovial fluid samples of patients with OA than in samples from healthy donors.26–28 Cells with MSC markers were located in the subintimal zone and around blood vessels in the synovium. Because inflammatory cells found in synovial membranes are derived from haematopoietic marrow and transported through the vascular system and peripheral blood, it is also suggested that MSCs may similarly migrate to OA synovial membranes. The presence of cells expressing MSC markers in the synovial tissues of healthy donors also suggests that in situ proliferation of MSCs in the synovium is possible as well.26 Finally, it has been reported that canals between the bone marrow and articular cartilage allow migration of MSCs with chondrogenic capacity into the cartilage and synovium of inflamed joints.23 Drugs could induce chondrogenesis in mesenchymal cells located in the superficial zone of normal and OA cartilage, in cells coming from haematopoietic marrow to the deep zone of cartilage, or in the synovium. The results shown by Yano et al8 in their paper do not provide an answer to this question. In animal models during the last decade, several molecules have been proven to have a DMOAD effect, and new candidates for DMOAD are emerging every year; however, none of these are indicated to treat OA patients. Some of the more recent candidates are intra-articular injections of antibodies specific for syndecan-4, which is involved in aggrecan cleavage by a disintegrin and metalloproteinase with a thrombospondin type 1 motif-5 (ADAMTS-5), which prevented cartilage destruction in a surgically-induced model of OA.29 Intraperitoneal injections of an inhibitor of the Hedgehog signalling activated in OA reduced the severity of OA by inhibiting cartilage destruction, possibly by Runx2 regulation, which in turn regulates ADAMTS-5.30 Subcutaneous injections of recombinant human PTH(1–34) (teriparatide) immediately, or 8 weeks after OA induction, partially reduced the severity of OA by suppressing inappropriate articular cartilage hypertrophy.31 In general, the major action of these agents is to block activation of the degradation enzyme and/or inhibits aberrant hypertrophy of articular cartilage by targeting signalling molecules involved in articular cartilage catabolism. However, TD-198946 induces chondrogenic differentiation of progenitors, as evidenced by a marked increase in the chondrogenic markers type II collagen and aggrecan, and it does this without promoting hypertrophy. This feature is very important because hypertrophic differentiation is a frequent and undesirable effect observed with conventional chondrogenic agents, including bone morphogenetic proteins, transforming growth factor-β, insulin and insulin-like growth factor (IGF-1). Although both papers from Yano group8 and Johnson group14 suggest chondrogenesis modulation and Runx1 as targets to slow cartilage degradation and OA progression, we must keep in mind that studies of chondroprotective agents using animal models have not provided good models for fully developed DMOAD in humans. In addition, Yano et al8 do not clearly demonstrate evidence of how TD-198946 induces in vivo chondrogenesis. They have also not demonstrated whether the induction of chondrogenesis is responsible for the reduction of joint damage, because MSCs also have anti-inflammatory effects, which could be the cause of joint improvement by an indirect mechanism. In their paper, Yano et al8 open the possibility that TD-198946 has a preventive effect because administration of the drug, prior to the development of OA, reduces cartilage degradation. This option would be possible only if the joint contains native MSCs with chondrogenic capacity. Although the presence of cells with MSC markers and chondrogenic capacity in normal human cartilage and synovium has been reported,17 ,18 ,21 ,26 we do not know how preventive chondrogenesis can stop the development of cartilage degradation and initiation of the OA process. In conclusion, because cells with chondrogenic capacity have been identified in healthy and diseased articular tissues (cartilage and synovium) and appear to retain at least some potential to regenerate/repair cartilage in vivo, compounds with chondrogenic capacity are a good option for development of a new DMOAD. Transcription factor Runx1 appears to be an ideal target to stimulate chondrogenesis in the joint. Drugs with the capacity to modulate Runx1 activity, such as TD-198946 and KGN, when administered directly into the joint space, successfully stopped the degeneration of articular cartilage in a surgically-induced OA mouse model. Rheumatologists need DOMOADs to treat OA patients; now is the time to confirm these exciting preclinical results by properly conducted clinical trials. C Ruiz-Romero is supported by the Miguel Servet program from ISCIII-Fondo Investigación Sanitaria-Spain (CP09/00114).
. Osteoarthritis: a disease of the joint as an organ. Arthritis Rheum 2012; 64: 1697– 707.
. Pathogenesis and management of pain in osteoarthritis. Lancet 2005; 365: 965– 73.
. Pharmacologic therapy for osteoarthritis, the era of disease modification. Nat Rev Rheumatol 2011; 7: 13– 22.
. The futility of current approaches to chondroprotection. Arthritis Rheum 2007; 56: 1378– 83.
. Regulation of chondrogenesis and chondrocyte differentiation by stress. J Clin Invest 2008; 118: 429– 38.
. Chondrogenesis, chondrocyte differentiation and articular cartilage metabolism in health and osteoarthritis. Ther Adv Musculoskel Dis 2012; 4: 269– 85.
. Osteoarthritis: an update with relevance for clinical practice. Lancet 2011; 377: 2115– 26.
. A novel disease-modifying osteoarthritis drug candidate targeting Runx1. Ann Rheum Dis 2013; 72: 748 53.
. Alternatively spliced type II procollagen mRNAs define distinct population of cells during vertebral development: differential expression of the amino-propeptide. J Cell Biol 1991; 114: 1307– 19.
. Runx-2 and Runx3 are essential for chondrocyte maturation, and Runx2 regulates limb growth through induction of Indian hedgehog. Genes Dev 2004; 18: 952– 63.
. Expression of interstitial collagenase is restricted to skeletal tissue during mouse embryogenesis. J Cell Sci 1995; 108: 529– 35.
. The distinct role of the runx proteins in chondrocyte differentiation and intervertebral disc degeneration findings in Murine models and in human disease. Arthritis Rheum 2008; 58: 2764– 75.
. Runx1/AML1/Cbfa2 mediates onset of mesenchymal cell differentiation toward chondrogenesis. J Bone Miner Res 2005; 20: 1624– 36.
. A stem cell-based approach to cartilage repair. Science 2012; 11: 717– 21.
. Metabolic labeling of human bone marrow mesenchymal stem cells for the quantitative analysis of their chondrogenic differentiation. J Proteome Res 2012; 11: 5350 61.
. Proliferative remodeling of the spatial organization of human superficial chondrocytes distant from focal early osteoarthritis. Arthritis Rheum 2010; 62: 489– 98.
. Identification of mesenchymal progenitor cells in normal and osteoarthritic human articular cartilage. Arthritis Rheum 2004; 50: 1522– 32.
. The surface of articular cartilage contains a progenitor cell population. J Cell Sci 2004; 117: 889– 97.
. New insights into cartilage repair, the role of migratory progenitor cells in osteoarthritis. Matrix Biol 2012; 31: 208– 13.
. Agingrelated loss of the chromatin protein HMGB2 in articular cartilage is linked to reduced cellularity and osteoarthritis. Proc Natl Acad Sci USA 2009; 106: 1181– 6.
. Mesenchymal progenitor cell markers in human articular cartilage: normal distribution and changes in osteoarthritis. Arthritis Res Ther 2009; 11: R85.
. Increased type II collagen degradation and very early focal cartilage degeneration is associated with upregulation of chondrocyte differentiation related genes in early human articular cartilage lesions. J Rheumatol 2005; 32: 876– 86.
. Migragory chondrogenic progenitor cells from repair tissue during the later stages of human osteoarthritis. Cell Stem Cell 2009; 4: 324– 35.
. Genome-wide expression profiling reveals new candidate genes associated with osteoarthritis. Osteoarthritis Cartilage 2010; 18: 581– 92.
. Repair of partial-thickness defects in articular cartilage:cell recruitment form the synovial membrane. 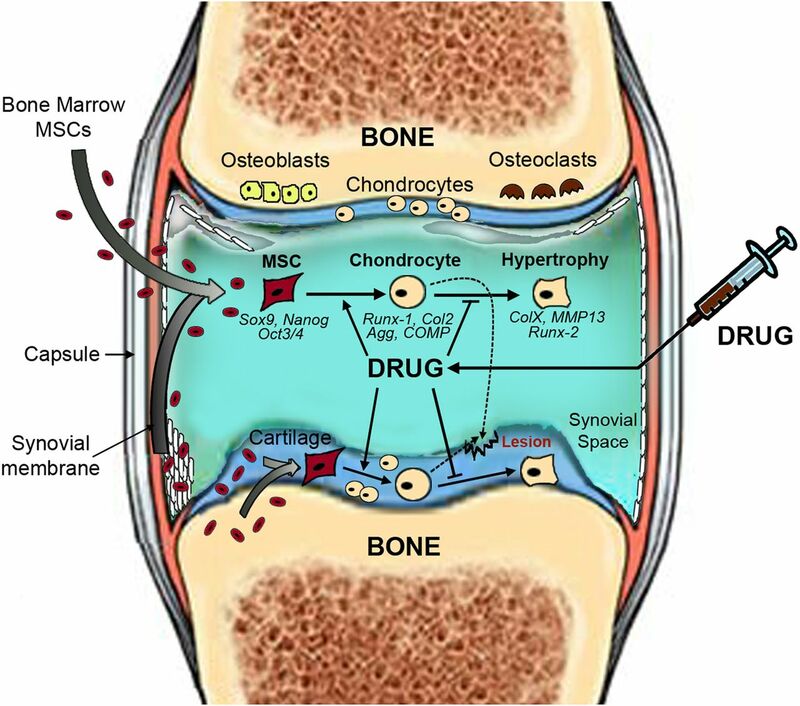 J Bone Joint Surg Am 1996; 78: 721– 33.
. Quantification of cells expressing mesenchymal stem cell markers in healthy and osteoarthritic synovial membranes. J. Rheumatol 2011; 38: 339– 49.
. Enumeration and phenotypic characterization of synovial fluid multipotential mesenchymal progenitor cells in inflammatory and degenerative arthritis. Arthritis Rheum 2004; 50: 817– 27.
. Multipotent mesenchymal cstem cells from adult human synovial membrane. Arthritis Rheum 2001; 44: 1928– 42.
. Syndican-44 regulates ADMTS-5 activation and cartilage breakdown in osteoarthritis. Nat Med 2009; 15: 1072– 76.
. Modulating hedgehog signalling can attenuate the severity of osteoarthritis. Nat Med 2009; 15: 1421– 25.
. Teriparatide as a chondroregenerative therapy for injury-induced osteoarthritis. Sci Transl Med 2011; 3: 101ra93. Funding This work was supported in part through funding from the Fondo InvestigaciÃ3n Sanitaria, Madrid, Spain (CIBER- CB06/01/0040; RETIC-RIER-RD12/0009/0018; PI12/00329) Ministerio Ciencia e InnovaciÃ3n (PLE2009-0144, ACI2010-1095 FEDER) (European Community). Contributors FJB and CRR have written and approved the final version of this editorial.